At the cusp of the twenty first century, a humble little automaker took a big step by unveiling their first ever SUV. When the Hyundai Santa Fe debuted, it was a truly global crossover that on paper, check off every box on the midsize utility to-do list. While solid but underrated, the unibody hauler was, without a doubt, one of the pioneers responsible for turning Hyundai from an afterthought to a seriously competitive automaker. Following the first generation’s launch were a wealth of equally designed cars that paved the way for the Fluidic design philosophy that has finally put the brand on the industry map. With the majority of Hyundai’s vehicles flowing while standing still, it is now time for the Santa Fe to follow suit. An all-new generation has not only created the 2013 Santa Fe Sport but has also created a whole new type of family. Born in 2001, the Santa Fe name has been Hyundai’s bread-and-butter SUV for more than a decade. With two generations under its belt, the third is looking to have the greatest market share to date and it will do so with a clever trick. For those of you paying attention, the seven seater Veracruz is lacking a 2013 version because, it is being replaced by one of the two Santa Fes being launched. Instead of calling the bigger model the “L”, “XL” or simply “Veracruz”, it will be called the Santa Fe while the smaller wheelbase variant will be called the Santa Fe Sport. Perhaps a bit confusing at first, Hyundai is hoping that due to the familiarity of the namesake, potential buyers will see it as a welcoming change. With about a 4 inch difference between wheelbases of the Sport and the seven seater, the two vehicles look remarkably similar. Even still, each has different purposes and rivals to compete with. In order to find out just how evolved the third generation is, we climbed all the way up to 8,347 feet above sea level to Park City, Utah. While there, we were given the opportunity to sample the Sport as the long wheelbase version has yet to fully leave the pre-production phase. With two engines, two drivetrains and numerous packages, the Santa Fe is available in 14 different guises. Honestly a bit much but people shopping for midsize SUVs tend to admire a wide array of choices. Base pricing starts at $24,450 and can go all the way up to $34,800 for the fully loaded AWD 2.0T Technology. Not one to pull any punches, Hyundai sampled out the best of the best by featuring the loaded Sport. Features included in our sample model were items such as navigation on an eight inch touchscreen, a 12 speaker Infinity supplied surround sound stereo, panoramic sunroof, manual rear sunshade screens and heated steering wheel. Standard features included LED headlamps, satellite radio, bluetooth device pairing, Hyundai’s BlueLink telematics and a tilt and telescoping steering wheel. Almost every single aspect of the 2013 Santa Fe is different from before including what’s under the hood. For the Sport, two engine options are available with one being completely new to the platform. Base motivation is supplied by a repeat of the naturally aspirated 2.4 liter GDI inline four cylinder. Classified as an Ultra Low Emissions Vehicle (ULEV), the powerplant puts 190 horsepower and 181 lb-ft of torque to either the front or all four wheels. Gone is the upgraded 3.5 liter V6 and in its place is the 2.0 liter turbocharged four cylinder borrowed from the likes of the Sonata sedan. Now familiar, the four banger uses direct injection, variable valve timing and a twin-scroll turbocharger to produce 264 horsepower and 269 lb-ft of torque. Slightly down on power from the six it replaces, the Theta II manages to push the Santa Fe Sport a higher rate of speed due to an easily forgettable but highly important factor: weight. Not only does the vehicle weigh less overall than before but the engine’s compact size means the Sport’s distribution is very impressive for an SUV. Full throttle acceleration is satisfying if not exciting as the Theta does a fantastic job of climbing to redline. Its low-end torque is stout but it’s the engine’s top end that is most impressive. Boost hits early on, doesn’t seem to let go and despite being an actual crossover, the Santa Fe Sport felt faster than the last turbocharged Hyundai we drove: the Veloster. As satisfying as it is to ring the Sport out at wide open throttle, most drivers won’t have their foot buried in the firewall all the time. This is where the Hyundai could use some polishing as part throttle and low rpms are not its strongest suits. The response time between input and actual movement is a bit lazy and a few times, real and safe power didn’t show its face until seconds after it was called for. After some thought, the problem could be chalked up to simple tuning as in a quest to achieve high economy, the Santa Fe Sport seems far too eager to drop its engine’s rpms. While driving around Utah, ECO mode was left off so it’s the Hyundai’s natural trend to stay out of fuel enriching boost. Even when this ”I’d rather just cruise” mood set in, getting the Sport back into “let’s hustle” mode is by no means abrupt or jarring. 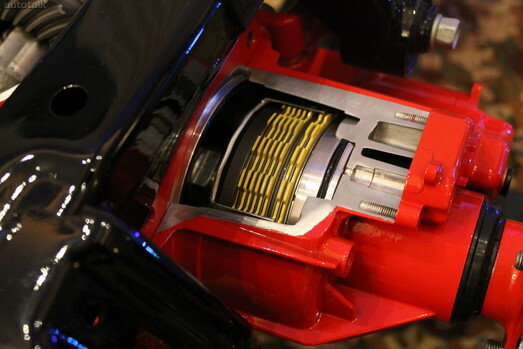 The movement from the drivetrain is never felt and the six speed automatic’s shifts both up and down are glass smooth. For being built in-house, the slushbox is plenty stout enough that being the Santa Fe’s sole gearbox isn’t an issue at all. Of all of the 2013′s changes, the most profound can been seen among the vehicle’s chassis. Compared to the 2012, the Santa Fe Sport is 266 lbs lighter than before while managing to be loaded with more features and becoming structurally stronger. At 3,459 lbs, the Sport weighs less than most of its competitors and even some “sporting” cars. Featuring Hyundai’s high tensile strength steel and a fully independent suspension, the SUV carries the mannerisms of a much lower car. 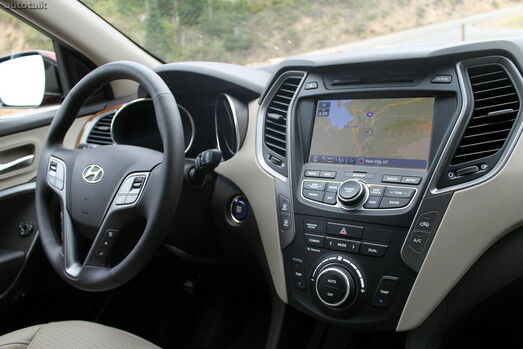 Using an electric assisted steering pump, the Santa Fe also features Hyundai’s Driver Selectable Steering Mode (DSSM) previously felt in the Elantra GT. Unlike inside the little hatchback, the utility’s use of the system is much more apparent. 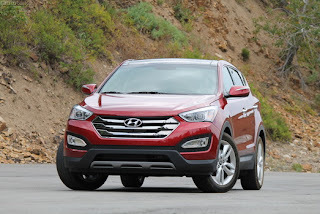 There is a crystal clear difference between the three modes and when placed in Sport, the Santa Fe gives the kind of feedback usually reserved for cars with tuned suspensions. Around the twisty mountain roads of Utah with numerous elevation changes, the Sport felt flat, controlled and confident and when things needed to slow down, it was obvious. Afterall, this is still a tall SUV and pushing really hard can result in understeer. Packed inside our sample Sport was a Dynamax all-wheel drive system. Fully automatic, the system features a locking differential and a rear electronic coupler. Active cornering control allows for torque to be properly distributed to all four wheels and when sensors detect understeer, traction and brake controls are mitigated to reduce it at all costs. During our time spent with the Sport, we traverse some mild forest roads and the system proved itself in the most important way: safety. 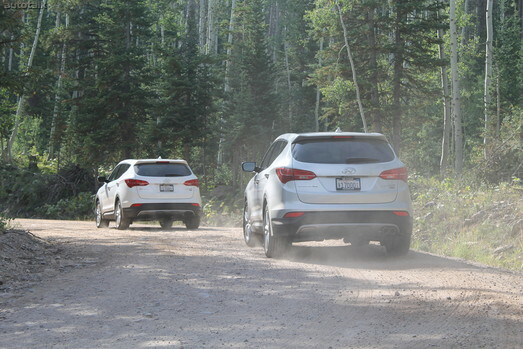 The Santa Fe isn’t designed to lift up a wheel crawling over rocks and for that reason, the active controls make traveling over slushy terrain easily manageable. It isn’t rough, tough and crude and its manners on gravel are just as quiet and cool as when on pavement. If you were to count how many midsize SUVs are available to you right now, you would have to take off your shoes. The segment is utterly crowded but even still, Hyundai has managed to create a stout competitor. With the boosted engine, power is aplenty and room and comfort is up there with the best. Perhaps most impressive of all is the vehicle’s noise, vibration and harshness (NVH) levels which were so good, the Santa Fe could easily be considered a premium luxury vehicle. The Santa Fe is so accommodating that it simply lacks the ability to offend anyone. It may have less than perfect throttle response and its navigation could be easier to use with better “hot keys” but those could be a quick fix. With its bold lines, chiseled overhangs and wide fenders, the Sport seems much more muscular than before and isn’t as bulbous as other offerings. It may be fluid but it isn’t overly cute and no “cool dad” should be embarrassed to drive the crossover to work. If anything, living with the 2013 Hyundai Santa Fe Sport might be one of the easiest tasks on the day’s to-do list.